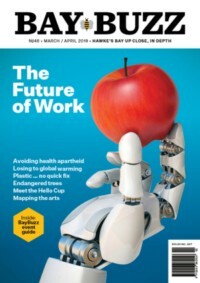 Six editions of BayBuzz magazine per year, conveniently delivered to your letter box. PLUS full free access to BayBuzz Digital — our complete 96-page magazine available exactly as printed on your computer, smartphone and tablet. Full access to our complete 96-page magazine available for online reading and downloading, exactly as printed. Viewable on your computer, tablet and smartphone on the attractive and ISSUU online reader. All eyes are on NZ these days — BB Digital is a great gift and connection for your overseas friends, rellies and business colleagues. buzz — food, events, arts and people. Then, add more effort to present it all with engaging design and first-rate photography … and a supporting website. Please consider topping off your subscription with an additional contribution, or simply make a donation online. Any amount will help us deepen and improve our editorial content. Option 1 – Pay online, just fill in this online form, choose the amount you would like to pay, then proceed to Paypal where you can use your credit card or Paypal account to make a secure payment. Option 2 – Electronic bank transfer, just transfer your payment to BayBuzz at: BNZ acct. no. 02-0655-0083775-000. Please identify yourself as the payer. 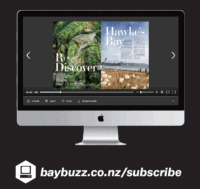 Email your address details to editors@baybuzz.co.nz or post them to: BayBuzz, PO Box 8322, Havelock North.